was a good Christian man. He is my paternal grandfather, we called him “Grandpa”. For those attending to detail in family research, it is self evident that so many things in official and government records are riddled with errors. An example would be the marriage record for James Alexander “Alex” Murray and Methel Estelle Gregory.The notation of race in the marriage record is completely in error. Their race was WHITE. The same is to be said of transcription errors; that is evidenced in the marriage record for his second marriage. His parents’ names are incorrect; should read Levi Murray and Lou Ella Vandiver. James Alexander “Alex” Murray and Methel Estelle Gregory had four living children: James Arlander Murray, Edward Lee Murray, Elmer Hillard Murray, and Alice Estelle Murray. James Alexander “Alex” Murray and Thelma McGee Murrayhad five children: Gary Thomas Murray and Sarah Murray who died as infants, Linda Marie Murray, Thelma Fay Murray and Ella Susan Murray. He passed away in 1981 after a battle with chronic Leukemia. He is buried at the Morning Star Cemetery, as are his wives. Marriage Place: Tuscumbia, Colbert, AL. Marriage of James Alexander Murray and Cecil Thelma Mcgee. 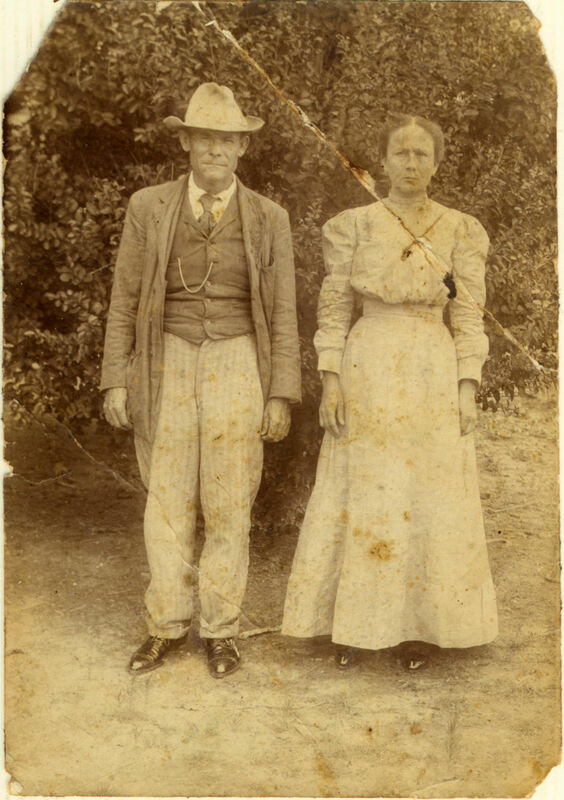 ↑ Citing this Record “Alabama County Marriages, 1809-1950”, database with images, FamilySearch (https://familysearch.org/ark:/61903/1:1:29NV-PH7 : 16 July 2015), James Alexander Murray and Cecil Thelma Mcgee, 1941. ↑ “Find A Grave Index,” database, FamilySearch (https://familysearch.org/ark:/61903/1:1:QVKV-Q5NR : 13 December 2015), James Alexander Murray, 1981; Burial, Tuscumbia, Colbert, Alabama, United States of America, Morning Star Cemetery; citing record ID 48935440, Find a Grave,http://www.findagrave.com. 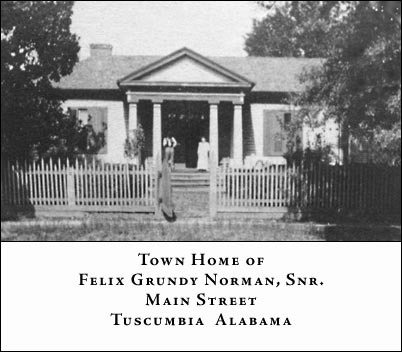 FELIX GRUNDY NORMAN, lawyer, was born January 4, 1808, near Smyrna, Rutherford County, Tenn. and died August 5, 1885 at Tuscumbia [Alabama]; son of John and Margaret [Stockird] Norman who lived at Smyrna. He was denied early educational advantages, but was taught in the rudiments by an older brother. He began life as a merchant but later taught school for several years. He studied under William Casper, was admitted to the bar in Tuscumbia in the early thirties, and practiced at that point and the surrounding country until his death. He was mayor of Tuscumbia for many years, and represented his county in the legislature for sessions of 1841, 1842, 1844, 1845 and 1847-8, inclusive. Although he supported the Confederacy with his means and influence, he was debarred from active participation on account of his age. He was a Democrat; a Presbyterian; and a Mason. Married: August 17, 1848 at Dickson, to Jane Lavina, daughter of Henry and Jane [Shelton] Cook of Spotsylvania County, Va., residents for some years of Huntsville, later locating in Tuscumbia where they spent the remaining years of their lives, the former for some time government agent for the disposition of Indian lands. Children: 1. John Henry; 2. Felix Grundy, m. Della Phares, Salinas, Calif.; 3. Mary Barton, m. John R. Charlton, La Verge, Tenn.; 4. Kate Cook, m. Hall S. Kirkpatrick; 5. Thomas Edgar, m. Lee Ellis, Memphis; 6. James Beverly, last residence: Tuscumbia. Source: History of Alabama and Dictionary of Alabama Biography, Vol. IV. by Thomas McAdory Owen, Chicago: S. J. Clarke Publishing Co., 1921. FELIX G. NORMAN, of Franklin [County Alabama], was born and educated in Tennessee. He represented Franklin for the first time at the session of 1841, and by continuous elections, he served in the House until the close of the session of 1847-8, since which time he has been in private life, engaged in the practice of law. While in the Legislature, Col. Norman was a very efficient member, both in debate and in Committees. He was a Democrat from honest conviction, and never departed from that faith, but always kept himself in the path of duty according to the best of his judgment. Acting on principle, he opposed at every step the resolutions of the General Assembly accepting Alabama’s portion of the proceeds of the public lands. In the same manner, he opposed what he considered the improper identity in the same resolution, on the Constitutional amendment providing for biennial sessions of the Legislature, and for the removal of the Seat of Government at the session of 1845. In all this, he only yielded to a sense of duty, to prevent injustice, or an unsafe precedent. However laudable his purpose, he course on the question of removal resulted to his injury, through influences subsequently brought to bear against him, in a political sense. For many years, Col. Norman was Grand High Priest and Grand Master of the Masonic fraternity of Alabama, who presented him, on his retirement, appropriate medals, commemorating his services to the craft. From his bearing in the Legislature, the courtesy he always exhibited in debate, the intelligence with which he handled questions, and the ease and graceful elocution which seemed natural to him, Col. Norman was unquestionably cast in a large intellectual mould, capable of expansion beyond the limits within which it was his fortune to be confined as a political aspirant. Although rigid in the tenets of his party, and at times somewhat acrimonious under provocation, he was not blind to the merits of a measure because it may have originated with his opponents. He was bold and fearless, often displaying the gallantry of ancient knighthood in the legislative arena, shivering a lance with friend or foe without personal malice. His face was luminous with good feeling, and his whole deportment was that of a gentleman sensible of the rights of others, and careful of his own, in all that relates to the substantial etiquette of life. Had his lot permitted a more congenial opening for the development of his character after the inward model, there is no doubt that Col. Norman would have filled a large space before the public, and achieved a reputation as proudly National as that which he now enjoys is, in local view, distinguished for ability and honor. Perhaps the greatest obstacle to his advancement to higher places has been a certain measure of self-respect and honorable sensibility, which made intrigue and management the usual medium of success repugnant to his nature. He has abundant reason, however to be satisfied with the result, in his own high and unimpeachable character. He is still in the meridian of life, and he resides in Tuscumbia. Source: Reminiscences of Public Men in Alabama, by William Garrett, Atlanta, GA: Plantation Publishing Press, 1872. Bibliography Source: Two Hundred Years at Muscle Shoals, by Nina Leftwich, Tuscumbia, Alabama, 1935: When the cornerstone of the new 1847 Tuscumbia Masonic building was put down, a engraved cooper plaque was placed inside the stone. Text of plaque in graphic above. The Norman house is an historic residence in Tuscumbia, Alabbama. The house was built in 1851 by Felix Grundy Norman, a lawyer who also served as mayor of Tuscumbia and in the Alabama Legislature from 1841to 1845 and again in 1847–48. Norman’s father-in-law was the land agent for the sale of the Chickasaw and his brother-in-law, Armistead Barton, built Barton Hall in nearby Cherokee, Alabama. The house sits on the corner of Main and Second Street, and has two identical facades facing each street. Each face has a central pedimented portico supported by four tuscan columns. Each portico is flanked by three part windows consisting a nine-over-nine sash window which is bordered by narrow three-over-three sashes. The interior retains its Greek Revival woodwork and mantels. JOHN NORMAN, brother of Felix Grundy Norman, was born in Rutherford County December 5, 1804, son of John and Mary Margaret (Stockard) Norman. Extent of schooling not determined. Married in Rutherford County Tennessee September 13, 1867, to Nancy Neal; children-Cynthia Jane, Margaret Rebecca, Mary A., Harriett E., Martha E., John B., Josephine B., and Sarah F. Norman. Removed to Carroll County Tennessee, c.1828, to engage in farming and clearing landholdings in 8th civil district. Appointed a trustee of Huntingdon Academy, Carroll County, in 1845 but resigned in 1848. Elected constable, 1832; sheriff, 1838-44; clerk of circuit court, 1854-56; county judge, 1856; one of committee to plan for repair of courthouse and building jail. Served in the Tennessee House, 33rd and 34th (Reconstruction) General Assemblies, 1859-61; 1865-67; representing Carroll County; served in the Tennessee Senate, 35th General Assembly, 1867-69; representing Carroll, Dyer, and Gibson counties; member Opposition Party in 33rd Assembly; Unionist in 34th and 35th. Mason; member of Zion Presbyterian Church. Died in Madison County October 5, 1874. Sources: Prepared Roster, House, 33rd General Assembly; Goodspeed, History of Carroll County, 802, 803; Rutherford County records: “Marriage Records, Vol. 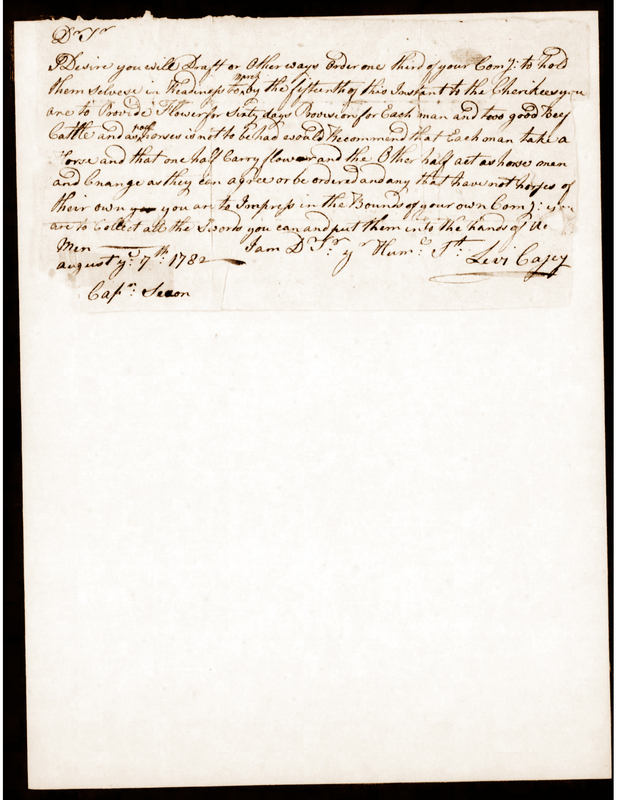 1, 1804-37,” p. 155; “Wills, Settlements and Inventories, Vol. 6, 1824-27,” pp. 194-95; Carroll County records: “Minutes, County Court, 1826-33, Pt. 2,” p. 532; “1838-42, Book 3, Pt. 2,” p. 223, 390; “1843-50, Pt. I,” p. 144, “Pt. 2,” p. 390; “1850-55,” pp. 25, 30; “1855-59,” pp. 59, 213-214; ‘Marriages, 1838-60,’ pp. 235, 274, 412; Jackson Whig and Tribune, October 31, 1874; infomation supplied by greatgrandaughters, Mrs. Julian Devault and Mrs. Allen Holliday, McKenzie. that may have been down on their luck in hard times, the names of those in the Colbert County Almshouse enumerated as part of the 1920 Federal Census by Melvin H Elkins from the 29th to 31st of January in 1920 will be included here. The Almshouse, or Poor House as many called it, was in the Camp Smith area of Colbert County; in District: 0013. There was a lot of shame that stigmatized those who were in a circumstance to warrant housing and care in such a facility. But, truly back in those days, if it was necessary to be in an Almshouse, one really needed the help and were likely elderly and sometimes without family to look after them. Fred W Bradford was the keeper of the Almshouse in 1920. Some give his middle name as Washington while others give his middle name as Walter. His obituary gives his name as Fredrick Walter Bradford; his parents were David Washington Bradford 1836-1866 and Julia Jarmon Bradford Grey 1844-1900. Fred Walter Bradford married four times. His first marriage circa 1885 was to Nancy Caldona Tharp. They had the following known children: Fredrick Washington Bradford 1892 -1957, Callie Fredonia Bradford 1896, Julia Dovia Bradford Cantrell 1887 – 1973, Ida Virginia Bradford Stonecipher 1889 – 1928 and Massie L Bradford 1897. His second marriage in 1901 was to Louvicey Lindsey. They had the following children: Willie E Bradford 1905-1935, William S Bradford 1906. There may have been other children. His third marriage in 1908 was to Sarah Josephine “Josie” Duncan Sledge. Her first marriage was to Thomas Ervin Sledge (son of William Henry Sledge, grandson of Macklen Sledge). Two Sledge children were from her marriage to Thomas Ervin Sledge: Thomas Grady Sledge and Bessie Ernestine Sledge Green. Fred Walter Bradford and Josie Duncan Sledge Bradford had the following children: Lillian g Bradford born and died 1909, Johnie E Bradford 1911, and Walter L Bradford 1914-1952. Josie Duncan Sledge Bradford died in 1931. Thomas Grady Sledge and Mamie Hand Sledge lived beside his mother and stepfather on the 1920 census. The age of Grady was 18 and his young wife’s age was 15. Next to them was the Colbert County Almshouse of which Fred W Bradford was the keeper. Listed in the household of Fred W and wife Sarah J Bradford were sons Willie E Bradford age 14, Johnie E Bradford age 9, Walter L Bradford age 5 and Fred’s stepdaughter Bessie Sledge age 19 and single. Shaw, Henry – age 76, black, married, born in Tennessee. Most of those inmates of the Almshouse do not have a surname that I am familiar with in our Shoals area. Perhaps some of their descendants are searching for them. James Henry Vandiver born 20 Sep 1869, died 15 Oct 1952 Colbert County, Alabama. His wife, Emma Pennington Vandiver born 23 Oct 1875 and died 5 Nov 1967. They are buried at Vandiver Hollow Cemetery in Colbert County, Alabama. ought to be easy, right? You would think so, and the further back you go the easier it gets because all the variations in spelling seem to dissolve into one – Narramore. My great-grandmother was Mollie Normour or Naremore or Narmor or Narramore. I started researching her in earnest any number of times, but each time was more frustrating than the last. Actually there are other misspellings of the surname, but I forget the others. Listen, my children, for you are going to hear (or read) of the tragedy visited upon six of the most helpless of them all. And, it relates to the Narmore (and variant spellings of the same name) descendants everywhere. I was researching the family of Narramore which connected to my Narmore lineage. Every minute since I discovered this unthinkable event, I have worried over these six little ones. Your line of Narmore’s may not even be connected with this line, but the story is a tear jerker at any rate. Get a tissue, you will wad it up, I promise you. First, let us target the only happy part of the tragedy. In 2002, August 4th to be exact, a granite memorial marker was placed and dedicated to the six Narramore children in the Riverside Cemetery in Barre, Massachusetts. The ceremony was attended by approximately three dozen. In the audience was the town historian, members of the Barre Historical Society, local politicians, and the Massachusetts Secretary of State. The six precious souls were laid to rest in pauper’s graves without even a gravemarker. The group gathered to remember the six slain children . The crowd dignified the existence of these six little souls with the gathering and placed a fitting memorial marker to document their short little lives. Two musicians played a flute duet for the occasion. On 21 March 1901 in Coldbrook Springs, sometime in the early afternoon, Lizzie Naramore killed her six children one by one. She began with the oldest and proceeded one by one to the youngest child. One by one she banged and chopped these precious souls to an unrecognizable condition using a club and an ax in the kitchen of the family home. She then, took a knife to slice her throat, but the cut was not severe enough to cause death. Elizabeth Ann “Lizzie” Craig Narramore made a plea of guilty in Worcester Superior Court to the murder of her eldest child, daughter Ethel Marion Narramore, age 9. She was found not guilty by reason of insanity. Mrs. Narramore was sentenced to life in the state hospital in Worcester. After serving a short five year sentence in the asylum, on 30 November 1906, she was decreed to be sane and released. I have done considerable research on this family and their forebears. Elizabeth Craig Naramore was a native of St. Andrews, New Brunswick, which is in Canada. Promotions for the area say that “everything about our town is special, including our status as a National Historic District, one of the oldest and loveliest in the Maritimes. St. Andrews is a treasure trove of beautiful architecture, unparalleled scenery and rich marine life; and our streets remain steeped in turn-of-the-century charm”. St. Andrews sounds like a place one would hesitate to leave. At the age of 19 she met and married Frank Lucius Narramore, born in Winchester, New Hampshire, but of Baldwinville, Massachusetts. It appears her friends and family were opposed to the match. Frank and Lizzie married 25 Oct 1890 in Templeton, Massachusetts. The couple removed to Coldbrook Springs, near the town of Barre in central Massachusetts. Mrs. Naramore was described as a hard worker and a loving mother. Husband Frank Narramore, who worked at the nearby Parker Lumber Company, was a well paid worker but also dependably undependable, abusive, and a womanizer. While Frank wasted the money he earned, Lizzie and their six children lived in poverty. Lena Blanche Narramore, age 12 months. A little distant in time, but before the massacre, Lizzie reached out to the Overseers of the Poor in Baldwinville for assistance. When the overseers visited the Narramore home they determined that the Narramore’s situation was dire to the extreme. Because of the dilapidated condition of the home and the absence of food for the children or family, the decision was made to take the children away from the parents. Five of the children were to be placed with foster families and the youngest, an infant, would be sheltered at a poorhouse in Holden, Massachusetts. Before the authorities were able to take her children away Lizzie made preparations and then killed them one by one and then tried to kill herself. She survived the suicide attempt though there was a cut to her throat. Lizzie Narramore made a plea guilty to the murder of her oldest child Ethel Marion Narramore. There was never a trial for the murders of the other children. Elizabeth Naramore was committed to the state mental asylum. After her release she left central Massachusetts to work as a clerk in a Boston department store, returning once in 1907 to visit the graves of her children. 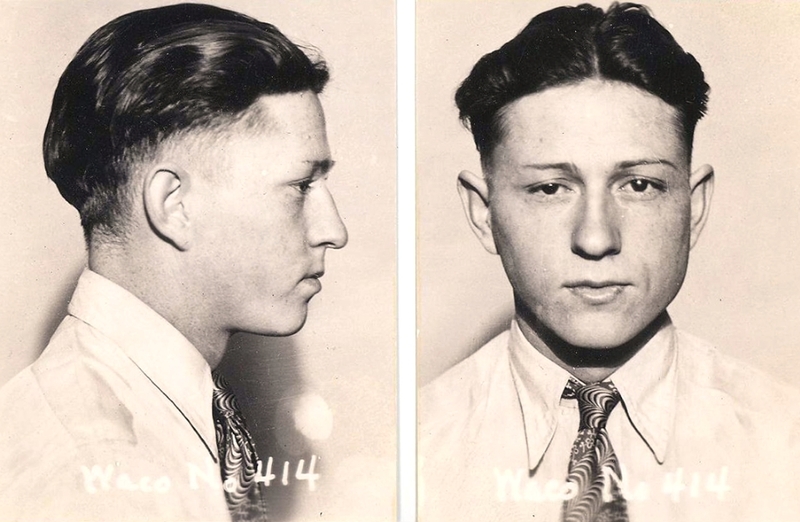 Frank Naramore left Barre after the children’s funeral and the subsequent trial of his wife. There are reports that he was never heard from again; and for sure the townspeople likely never wanted to hear from him again. In hindsight, he was in plain sight. In 1930 he was a roomer, at age 67, in the household of Charles H Voller with Voller’s wife, and two daughters. They lived on the last house on Congress Street in Worcester, Massachusetts. In 1931 he was in the city directory in Worcester and listed as a carpenter. He died in Worcester, Massachusetts in 1936, but no grave-site has been found. At the funeral for the children, the Reverend Charles Talmage, pastor of the Barre Congregational Church, gave an impassioned speech which placed the blame for the situation squarely on Frank Narramore as an abusive father and the community at large for turning a blind eye to all but criminal home situation for those six precious souls. I don’t know, but I do fairly believe that I would have taken an ax and a club to a no good for nothing husband rather than my precious kids. Below is the newspaper article about it in the Arizona Republic; published 22 March 1921. How many whacks with an ax and club did Lizzie deliver? 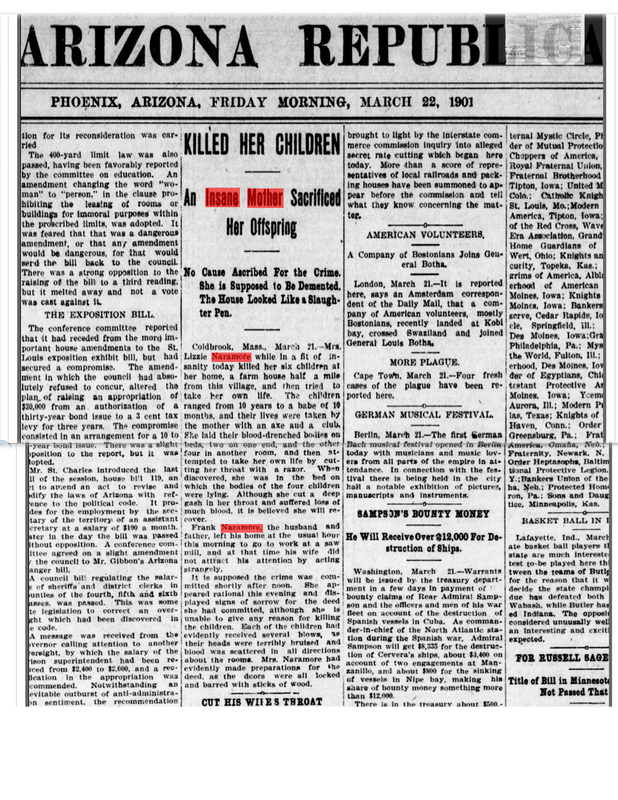 Arizona Republic, Article: “An Insane Mother Sacrifices Her Offspring”, daily newspaper, front page, 22 March 1921. Bradford L. Miner. (2002, June 30). A final tribute ; Six slain children will be forgotten no longer. Telegram & Gazette,p. A1. Retrieved 18 July 2014, from Massachusetts Newsstand. (Document ID: 130795151). Bradford L. Miner. (2002, August 5). A town bears witness ; Barre memorial honors six slain children: Telegram & Gazette,p. B1. Retrieved 18 July 2014, from Massachusetts Newsstand. (Document ID: 146878981). 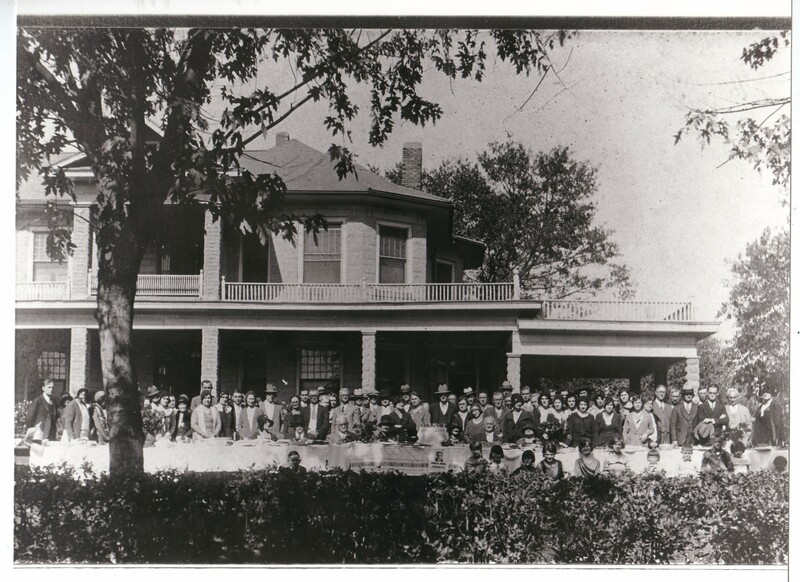 shows descendants of Levi Isbell at the 1930 family reunion at the Isbell home on Main Street, Albertville, Alabama. The home was later demolished but stood on the court house square across the street from the court house. Levi Isbell was the brother of our James Isbell. Levi Isbell married Sarah “Sallie” Birdwell and James Isbell married her sister Elizabeth Birdwell. James and Elizabeth Isbell are my third great-grandparents on my Murray line. The Murrays who married Isbells moved from around Paint Rock and Larkinsville in Jackson County, Alabama sometime between 1865-1870 to Colbert County, then Franklin County, Alabama. This photo montage of Box and Peebles family members is wonderful.